s-bag CLINIC ANTI-ALLERGY For healthy air! 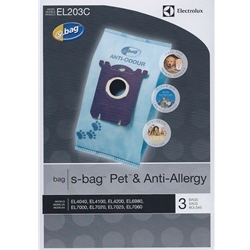 s-bag CLINIC ANTI-ALLERGY is a high performance synthetic dust bag developed to meet the specific needs of allergies sufferers, and more generally of people demanding a higher level of hygiene. When vacuuming, s-bag CLINIC ANTI-ALLERGY filters the air and retains up to 99. 9% of dust, pollens, spores, dust mites, mite allergens, cat allergens and other harmful particles as small as 1 micron (meaning 15 times smaller than the diameter of a human hair). Extremely high filtration: This new synthetic high filtration material retains up to 99. 9% of household dust: the air is purified when vacuuming and the exposure to allergens is reduced thus providing a healthier home environment. Anti-allergen effect: As s-bag CLINIC ANTI-ALLERGY leaves a healthier home environment and cleaner air in the home (99. 9% pure), it reduces the exposure to allergens. A healthier home helps you to reduce the risk of allergies in your family. High level of hygiene: Thanks to the unique patented s-bag closing system, the dust always remains inside the dust bag and there is no spillage when it’s removed from the cleaner. Longer lifetime: It can be used longer than a normal paper dust bag since the dust is absorbed into the bag without blocking the pores, thus avoiding reduction in suction power. The bag, with its synthetic material, adjusts itself perfectly to the shape of the bag compartment optimising the space available, the capacity of the bag and its lifetime. As a result, you no longer need to change dust bags so often. Max suction power: Its synthetic material ensures optimum air flow and an even better distribution of the dust which has been sucked up. It will give your cleaner more constant suction power as the dust bag fills up. This bag therefore provides a convincing cleaning performance over a much longer period of time.